Cast your mind back to the beginning of Game Of Thrones season 7, and an unexpected singing scene that set the Internet alight. In that episode, Arya came across a group of Lannister soldiers who were sharing a meal and singing around campfire. One of them was notoriously played by Ed Sheeran. At the time Ed received a bit of flack for the appearance, with commenters on social media feeling that a celebrity cameo was out of place in the world of Westeros. He was never referenced again or seen in any of the subsequent battle scenes. However here we are at the beginning of season 8, and we may have the answer to what happened to Ed's character! 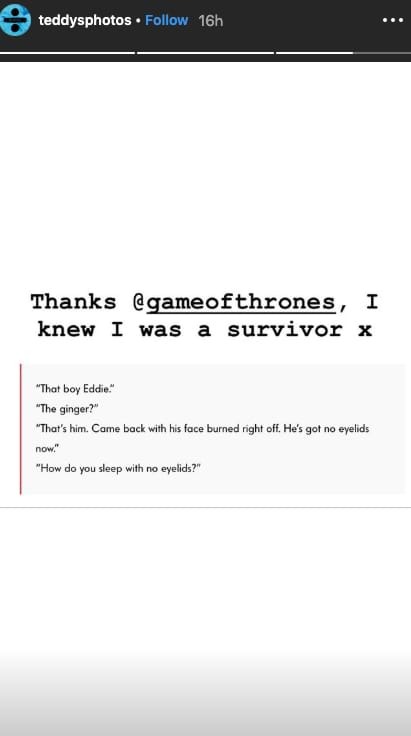 When Bronn was seen enjoying time with three lovely Kings Landing ladies, they got into a discussion about a "ginger" called "Eddie" who was a soldier in the Lannister army. “That boy Eddie,” one of the trio said. “The ginger?” the second woman replies. “That’s him. Came back with his face burned right off. He’s got no eyelids now,” the first woman explains. “How do you sleep with no eyelids?” the third asks. He seems pretty happy about this! Will Cersei Become The Mad Queen?